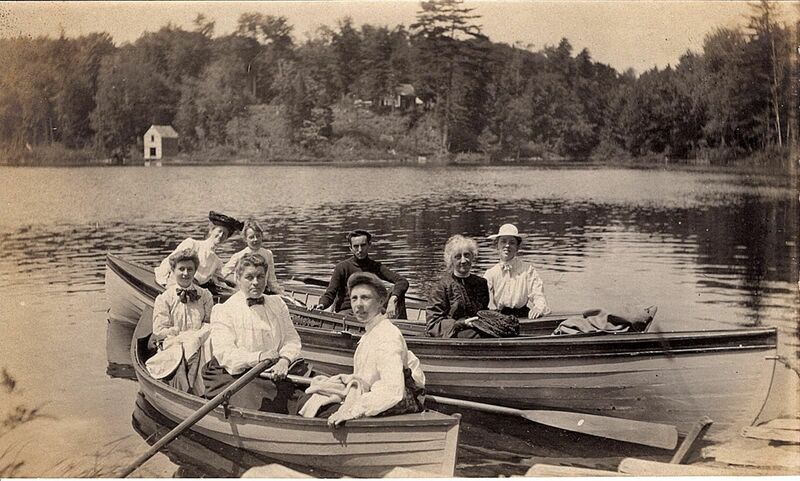 I’m always on the looking out for vintage and antique photos showing women engaged in sporting and travel activities, so when I ran across a little album of one woman’s trip to the Adirondack Mountains of New York, I excitedly exchanged a fist full of dollars for it. I’ll hope you’ll agree that I got my money’s worth. The homemade cover identifies the setting as the Adirondacks, and several of the photos are captioned with the name of a lake or mountain. But even though many of the photos are partially loose and I can see the backs of them, there’s not a single name recorded. What a shame! I do think that the keeper of the album was the woman on the left above, as she features prominently in many of the photos, even some extras added at the back of the album that do not seem to have been made on this particular trip. There are also no dates, but it’s pretty easy to narrow it down. Mohawk Camp was built in 1897. Judging by the clothing of all the woman in the photos, I think this was made just a few years later. The women are all pretty much wearing the casual “uniform” of the “New Woman” of the early twentieth century – the shirtwaist blouse with dark skirt. The shirtwaists are mostly in the droopy front style, sometimes referred to as the “pouter pigeon.” Most are wearing pompadour hairstyles with hats perched atop. Mohawk Camp was like many of the Adirondack “camps” in that they were as much hotel as they were camp. 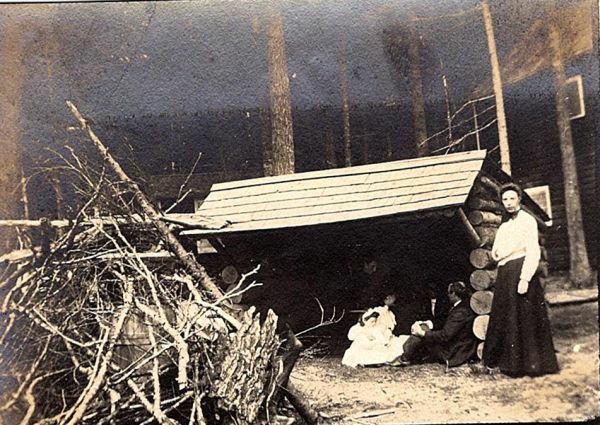 There was usually a range of accommodations, where one could sleep in a tent or lean-to, and when that grew tiresome, they could upgrade to a cozy bed in the hotel or a cottage. Camp Mohawk was located on Fourth Lake in the Fulton chain. The lakes were numbered up to Eighth Lake, and our traveler viewed them all. You’ll notice a lot of women in these photos, often in the company of a man. He’s probably a hired guide. According to The Adirondacks Illustrated by S.R. Stoddard and published in 1912, a guide was a necessity, and could be arranged for $3 a day. Maybe all these women pooled their money to pay for their guide. Here we see our traveler trying her hand with a fishing pole. She labeled this photo as Bubb Lake. 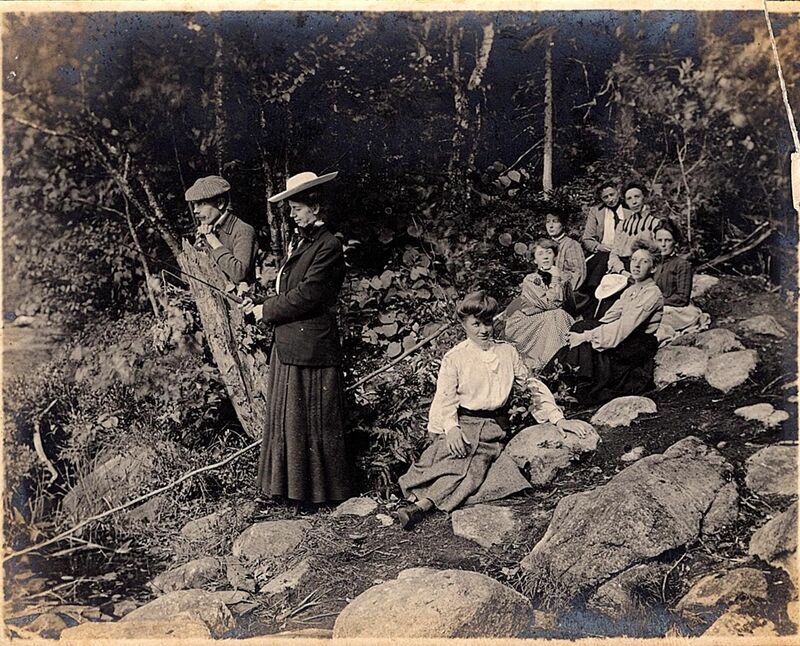 It is possible that the woman sitting in front is wearing a divided skirt, and her shoes look very practical for the woods. Still, none of the women look as though they are ready for roughing it in the woods, with skirts that don’t seem to have been shortened for walking. Bubb Lake is about three miles from Camp Mohawk, so this would have been a day hike. On other days, boats (and guide) were hired for exploring the various lakes. This is Fifth Lake. 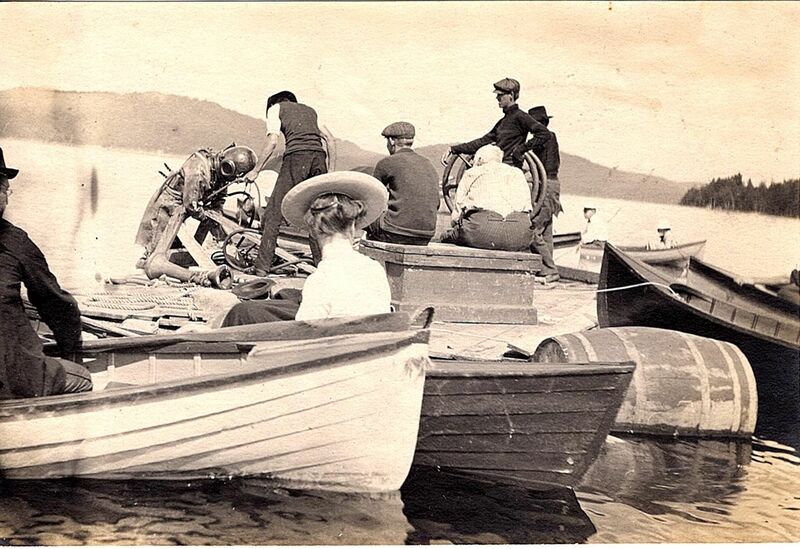 In what is the most unusual photo of the group, the traveler is the only woman seen in this venture out with a diver. 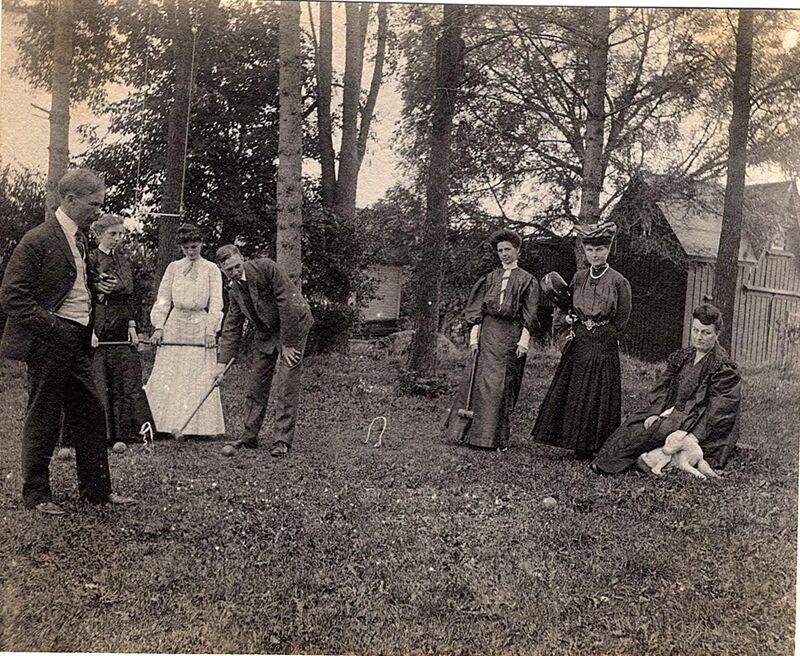 Back at the camp, the group is more formally attired for a game of croquet. Is that our traveler, third from right? 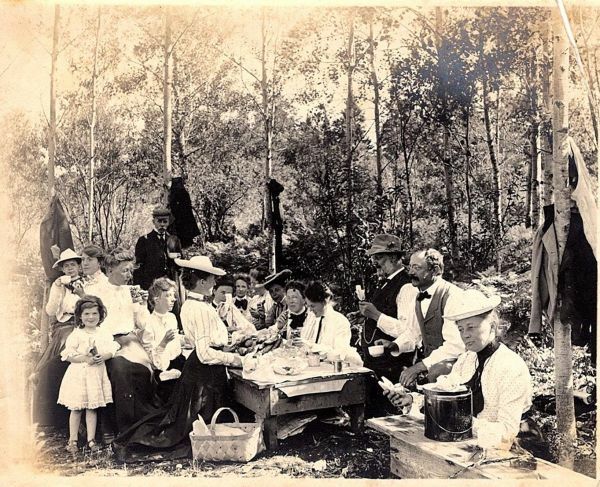 Picnics were arranged, and here we have one of the few appearances of a child. Maybe she belonged to a member of the staff. For visitors who wanted a rougher camp experience, a night in the lean-to would fit the bill. Otherwise it was ideal for just hanging out. Back in civilization, here is our traveler with two companions. Neither seems to be in the camp photos. 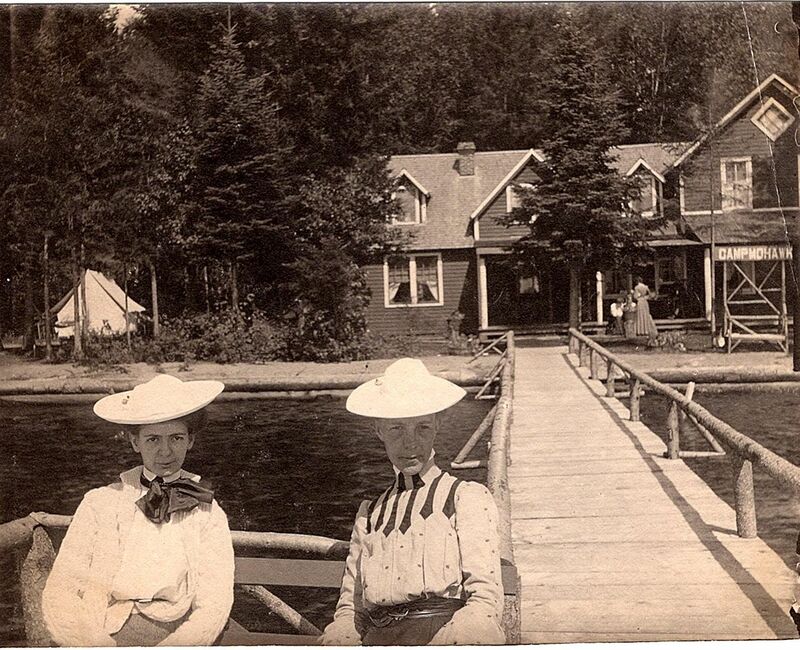 These photos were glued in the back of the album, but it is possible they could pre-date the Camp Mohawk trip. 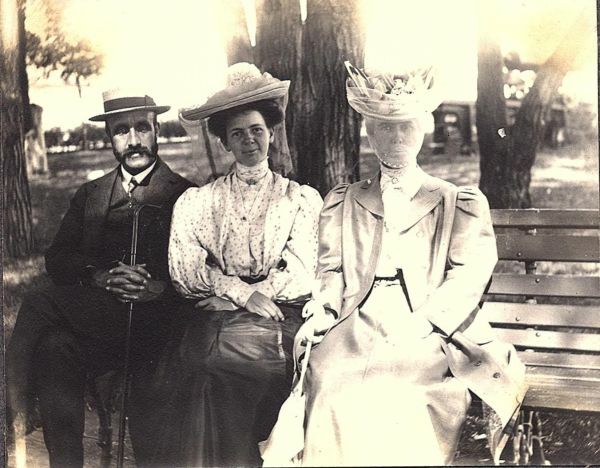 Here is the trio, in a photo taken the same day, at least their hats lead me to think that is the case. Our traveler has changed in to a white ensemble, quite appropriate for the shore. Fabulous! You got your money’s worth indeed, Lizzie, and thanks so much for sharing these rare images with us. I must admit, I can’t quite envision these women–even in their scaled down “outing” costumes–sleeping on the ground in a leanto! Carrie, I knew you would appreciate this. 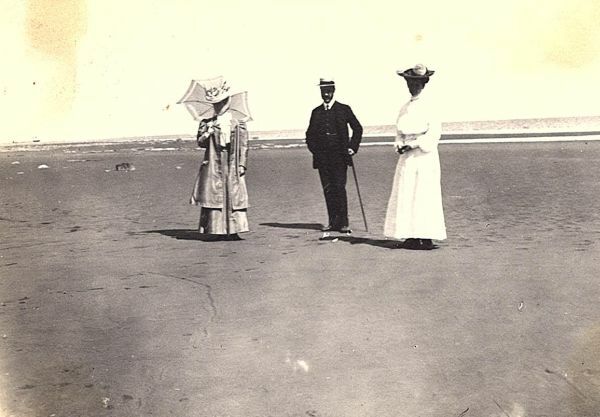 I have similar old photos of family -dressed in “Sunday best” on the rocks! Our family farm was near the Applachian Trail-the lean to is a rustic experience- even for a kid. Fun if you like snakes and sleeping with wildlife. I just LOVE this….especially the last picture. My husband who grew up in NJ, swam with these types of ropes in Ocean Grove in the late 1950’s into the early to mid 60’s. Love the classy architecture of the covered pier too. Looks to me as though your young traveler is sitting between her parents on the bench. She is almost the spitting image of the veiled woman…same nose, mouth, and shape of face. Lovely clothes and accessories. You’ll have to invent one! 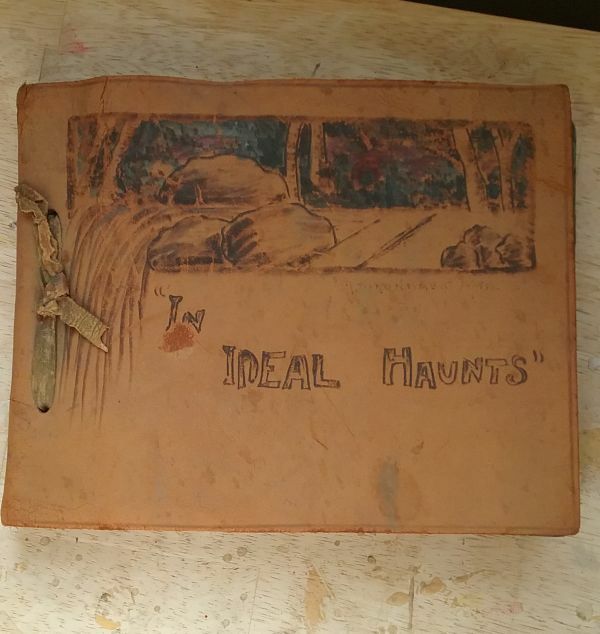 I have another photo album, this one from the 1920s, that I’ll be showing off soon. Thanks! Worth every penny! What a wonderful album. And could you send me a close up of the older looking woman, far right, in the croquet scene? Her clothes look a little different than the others. Cute dog, too. The photo is on its way. What a great find! I think I have some photos like this around, if so I will scan and put them on dropbox if you’re interested. I would love to have the scans. Thanks!